Why should grown-ups have all the fun? Qualcomm has developed a new chipset that aims to build a worldwide wearables market for kids. Smartwatches for the under-12 set are already popular in some Asian countries, including Korea, providing a way for parents to keep track of their kids when they’re away from home. 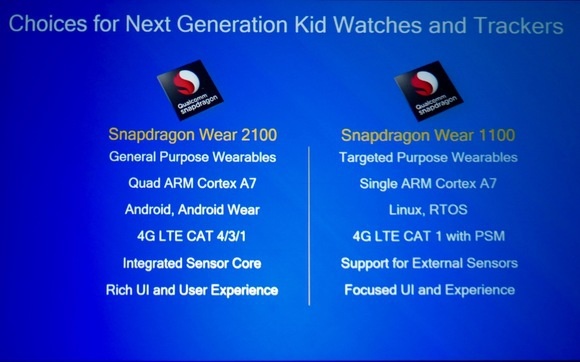 Qualcomm hopes its new chipset, called the Snapdragon Wear 1100, will help take that phenomenon worldwide. It’s working with a few partners who plan to release wearables for kids later this year. The chipset includes GPS for location tracking and LTE support for making calls. “You’ll always know where your seven-year-old daughter is -- she can always call you. And if she leaves school when she’s not supposed to, you’ll know where she is,” said Pankaj Kedia, head of Qualcomm’s smart watches division, at the Computex trade show in Taipei. The new chipset isn't only for kids' products. Qualcomm says it's for any device with limited, targeted capabilities. That can also include smartwatches for the elderly, fitness trackers or smart headsets. "These devices focus on two, three or five use cases and do them really well," Kedia said. It builds on the Wear 2100, Qualcomm’s first dedicated chipset for wearables announced in February. While that device can run Android, Android Wear, webOS and other "high-level" OSes, the 1100 runs only Linux and RTOS. The new chipset also has less components than the 2100, making it smaller and cheaper. It doesn’t have integrated sensors that track motion, for instance. Qualcomm says it can run LTE on standby for a week without being recharged. One device maker that plans to use the 1100 is Infomark. It makes a kids’ smartwatch called the Joon, based on an older 3G Qualcomm chipset, which sells in Korea for US$100-$150. It plans to release new devices with the 1100 chipset later this year. Several other Qualcomm partners here said they planned to release kids products too, including SurfaceInk and Aricent. Qualcomm said both chipsets, the 1100 and 2100, will ship in the second half of the year.